You’re starting to make fishing as your hobby. One of your colleagues told you to bring pliers since you’ll be needing it. Since you don’t have sufficient knowledge on fishing tools, you brought your regular home pliers. A week later, you’ve realized that it rusted and is now useless. Darn! The lesson behind the story - use the right tools for every application. No need to worry fishing neophytes. 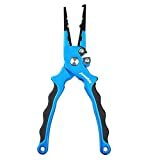 In this article, I will share with you some of the best fishing pliers for your next fishing expedition. According to Fish Finders Pro, your main purpose of buying the fishing pliers must come first. If you have noticed, all products have limitations. Thus, we need to align our needs with the limitations of the product. The materials of the products may tell you how long you may expect it to last. In the case of fishing pliers, always look for light but robust materials. Fishing Tips Depot suggests looking for aircraft grade anodized aluminum. When fishing, you will not just be cutting lines. You may perform other tasks such as crimping among others. Therefore, you must consider a product versatile enough to perform multiple functions. Thus, you can save money by buying a single tool. Fishing conditions may not be as comfortable as you think. You may need to carry heavy stuff on board. Not to mention, you need to battle off the resistance of your catch. Hence, it is very important to look for a fishing pliers that is light and easy to hold. 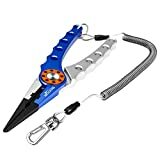 I bet you wouldn’t want to lose your catch just because of heavy pliers. 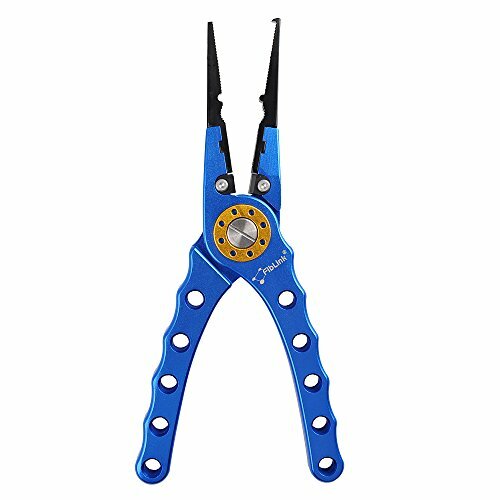 First, we have the Piscifun Aluminum Fishing Pliers. I am very confident to review this product to you. It’s a complete package that includes the fishing pliers, lanyard, nylon sheath, and Allen key. This product has an aircraft-grade aluminum material. Meaning, it is virtually corrosion free. In fact, Sports Fishing Mag recommends fishing pliers that can resist the unforgiving saltwater. Another great feature of this product is its titanium-coated stainless steel jaws. You’ll find this feature very useful when you’re dealing with extra hard wires and cables. Also, it ensures that this product will last long. Finally, the machine-cut aluminum handles make it very light. It’s advantageous for you ergonomically and will not put too much strain on your hands. Despite the advantages of using this Piscifun Aluminum Fishing Pliers, there are some downsides. For example, I am personally disappointed with the quality of the lanyard, it detaches easily from the body. Also, you may need to tighten the screw that holds the cutter needs more frequently. If you’re into huge fishing expeditions, I won’t recommend this product. However, if you’re into small to average size fishing, this product might serve your purpose well. It is light, ergonomic, and durable. Also, the addition of a tungsten carbide cutter makes fishing a lot easier for you. Finally, the coiled lanyard ensures that you will never drop the pliers in deep waters. 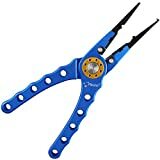 Next, we have the flagship fishing pliers from Mad Bite. It is one of the hot items on Amazon. With a price less than $30, there’s no wonder why this product sells like hotcakes on Amazon. Also, it is one of the most desired fishing pliers. There's so much to love about this product. For one, it uses a hardened aluminum alloy as its main material. Thus, it can last long and resist corrosion. Second, it is a multifunction tool with functions like a split ring, crimping, and flatting jaws. It is also very sharp allowing you to cut through hard string and objects. In addition, its tungsten carbide coated steel jaws is very powerful. You can virtually cut any type of fishing line using this tool. Lastly, it includes a lanyard and protective sheath. 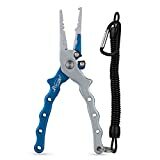 It allows you to keep the pliers within reach no matter how rough the waters may be. With its advantages come a slew of cons that you need to be aware of. Despite its tough and sharp blades, it cannot cut a 50-lb mono line, trylene, and other similar lines. It makes this product suitable for light to mid-ranged catch. It is normal for a given product to have its limitations. Thus, as a consumer, you must be able to know if the product you’re buying serves your purpose. I would personally buy this product if I am in the market for a new fishing pliers. If fishing is simple your hobby, this product might be perfect for you. Its versatility allows you to use it in multiple applications not just for cutting. For me, it's a huge plus factor. Finally, you will fall in love with its price. Who doesn’t love getting a quality product without spending more? Retractable lanyard included to attach to clothing or fishing vest. Our third best fishing plier comes from Fiblink which is a popular company when it comes to fishing tools. 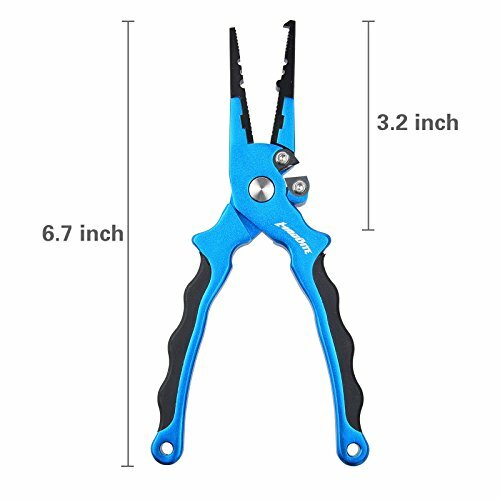 Similar to other products on our list, this fishing pliers offer a wide of features. More importantly, you wouldn’t resist it's very affordable price. Fiblink Saltwater Aluminum Fishing Pliers can be your ultimate fishing buddy. Fiblink uses CNC-machined aircraft grade aluminum as its main material. It's perfect for people who want light but robust fishing pliers. To make it last longer, the material is also anodized. Meaning, it can resist corrosion due to salt water. If you prefer a product that will not cause strain on your hands, this is it. Its design is very ergonomic to your hands. What I personally love about this product is its replaceable blades. It uses tungsten carbide material for superior performance. So if the blades give up for some reason, there’s no need to buy new pliers. Simply replace the blades, and you’re good to go. Despite its awesome features, it has a few disadvantages. First, some customers notice that the screws loose quite frequently. However, you can easily tighten it with appropriate tools. Another downside of this product is the tendency of its blade to break. It usually happens if you cut 60-lb mono and bigger. Lastly, some users complain that it can rust very soon. Regardless of these negative feedbacks, its satisfied customers outnumber those with complaints. Although there are a few complaints about this product, I would still recommend it for you. This product may suit you if you’re just into light fishing. Again, allow me to reiterate. You need to know the limitations of the product you’re buying. Then, check if it is suitable for your purpose. This way, you will save time and money by buying the right fishing pliers the first time. Our next product is from The Fishing Tree. Just like the rest of the pliers on our list, it's also selling like hotcakes. It should not come as a surprise since it comes with a long list of features that every fishing enthusiast would love. It is still in stock, so you better grab your own while supplies last. One of the most prominent features of this product is the spring loaded bent jaws. 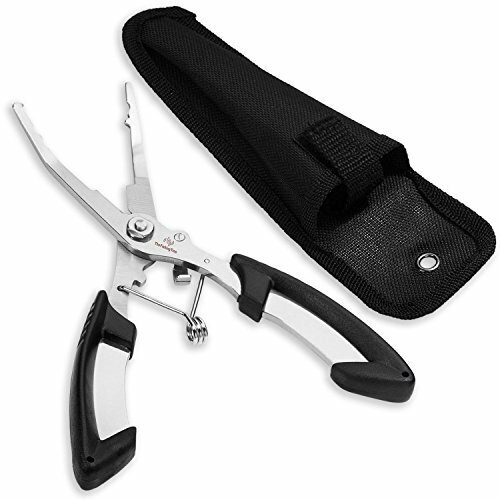 It's perfect if you want to remove fish hooks with ease and convenience. In fact, it could be one of the best extracting tools available. Also, if you frequently make angling gifts, it will be a lot easier with this model. It can make precise and professional cuts with its sharp blades. Would you believe it can cut up to 100 lb lines? You should never worry about losing it while at sea since it comes with a kitbag. Finally, it's accurate split ring tips and crimper allows you to get a new tackle quickly and bait readily. Despite its stellar reviews on Amazon, some users have negative observations about this product. 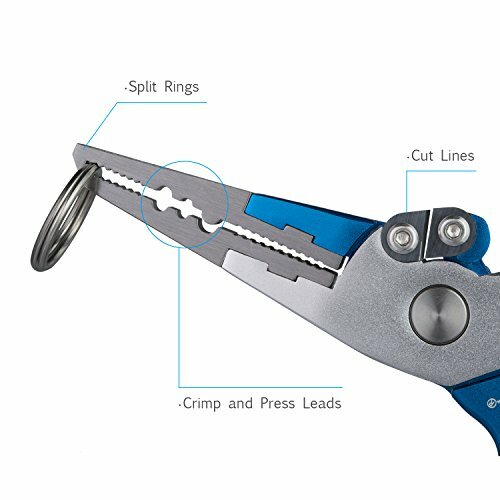 First, some users complain that the pliers easily slips from their hands. It's a very important concern since it can ruin your fishing experience. Other consumers also find it a little too small for their liking. Other than that, buyers did not raise any major concerns. For this reason, this product got an amazing 4.3-star rating. Of all the items in the list from Amazon, this is my ultimate choice. The main reason behind is its ability to cut bigger fishing lines. This feature makes it good for a bigger catch as well. Meaning, you don’t need to buy new pliers should you decide to step up on your fishing adventures. Spring loaded bent jaws to remove fish hooks. One of the simplest hook removal and extraction tools available. Stainless steel cutter cuts cleanly even on the lightest thin nylon monofilament, multifilament, fluorocarbon, braided lines, 50lb line or even 100lb. 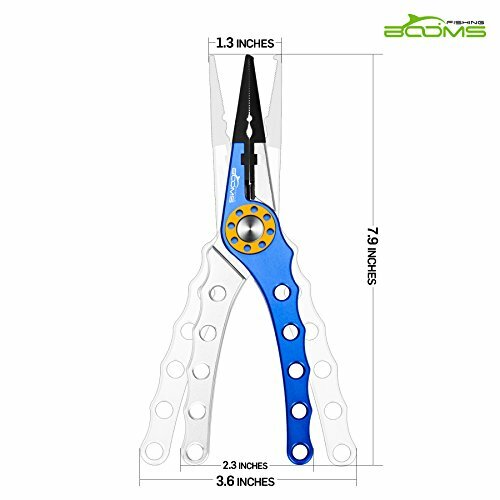 Last but not the least, we have an incredible fishing pliers from Booms Fishing. It guarantees 100% satisfaction with its features that benefits fishing enthusiast wherever they may be. In fact, they’re vouching on the performance, value, and reliability of this product to make your fishing enjoyable. One of the highlighted features of this product is its 70 + HRC tungsten carbide cutter. It allows you to cut perfectly even on braided lines. To reinforce its jaws, the manufacturer included coated carbon steel inserts. As a result, it gives the product unequaled strength and durability. Since it uses anodized aluminum material, no need to worry about using it in both fresh and salt water. In fact, it can resist rust and any form of corrosion. Finally, since it is almost 8 inches, it is easier to use in deep and covered areas. Just like any other product, it too has downsides. For one, some people noticed rust even after the first use. Some find the screws loose and you may need Allen type heads to tighten it. Lastly, some customers would have wanted a latch to keep it closed when not in use. If I were to decide, this product is still worth your try. Yes, it has some issues about corrosion and other petty things. However, we cannot deny the fact that this product gets the job done. At a very affordable price, this product is simply hard to resist. Buy it through Amazon today. If I were to buy now, I will be honestly torn between Piscifun and the Fishing Tree Pliers. Well, both pliers have the basics that you need. For example, both are affordable, ergonomic, durable and long lasting. However, the Fishing tree pliers won my heart. Compared to the other products, it has the capacity to cut up to 100-lb lines. It means that I don’t have to buy another pliers for heavy duty fishing. Did you learn something new today? I hope this article can help make a decision as to which product to buy. Again, I highly suggest choosing the Fishing Tree pliers since it can cut lines that other products cannot. In addition, it is versatile, ergonomic, and durable enough to last long. Please don’t hesitate to share your thoughts by leaving a comment below. I will appreciate it if you can share this article with your friends.